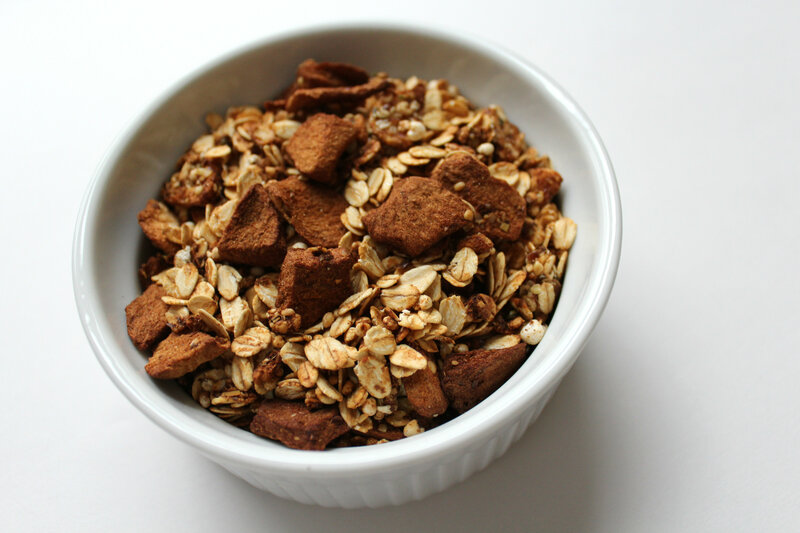 An easy apple cinnamon granola full of the classic flavor combination! 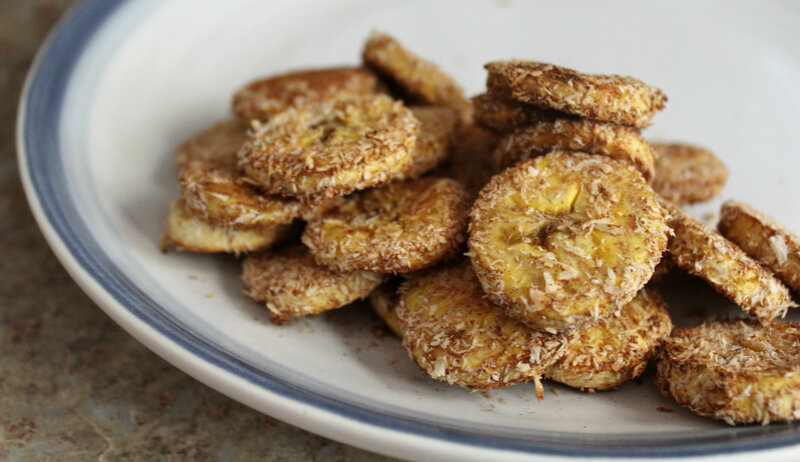 Perfect for breakfast or snacking all season long while keeping things healthy, gluten-free, and vegan! Boy do I have a treat for you! As I mentioned on Monday, I made some granola over the weekend. This was my third time making homemade granola and my second recipe. I just winged it as usual using some new ingredients I had picked up at the grocery and low and behold, it came out pretty damn good! 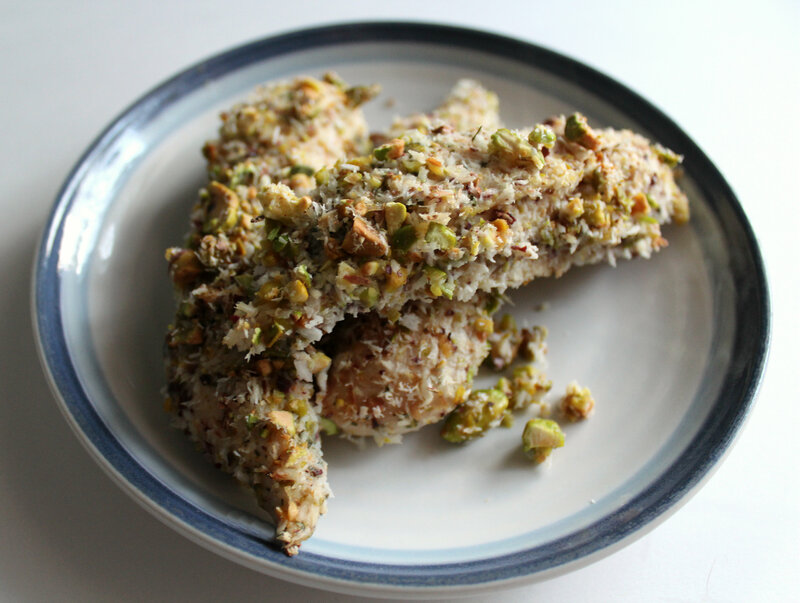 Granola is such a fun and easy snack or can be made into a very satisfying breakfast. When you make it yourself you control what you want to put in and just how healthy you want it. No sodium and processed sugar here! Just good old healthy whole grains, fats, and flavor. Nothing artificial, just real clean food, just what I like! I am continually blown away by my first-try recipe creations that come out just so delicious. It just takes some agonizing about the ingredients and methods for a few days, but then when I go to make what I have in my mind, 90% of the time it comes out perfect. The other 10%, well we don’t have to talk about that 😉 I like to have no limits or parameters to cook within, but sometimes a little direction can help. 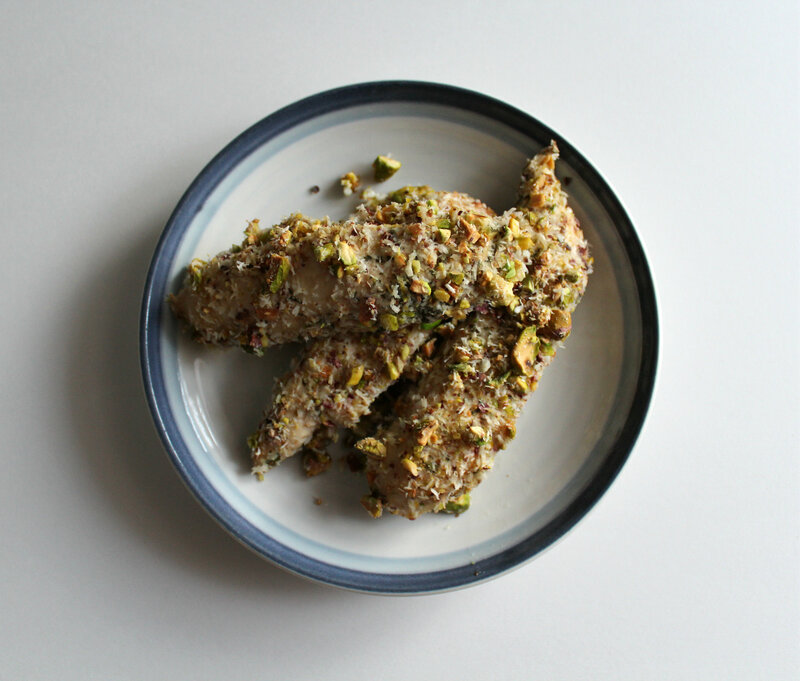 So when I saw that Recipe ReDux was holding another sponsored recipe contest, I knew I wanted to participate this time. + First you want to marinate the chicken. In a bowl zest and juice both limes. Then add in the garlic, onion, pepper, and cilantro and give it a stir. Place the chicken strips in a large Zip-Lock bag and then pour the lime mixture over the chicken. zip it up and give it a good massage to get the flavors all over. Then place in the fridge to marinate for 6-8 hours. + Next, prepare a baking dish (wiped with oil or non-stick). 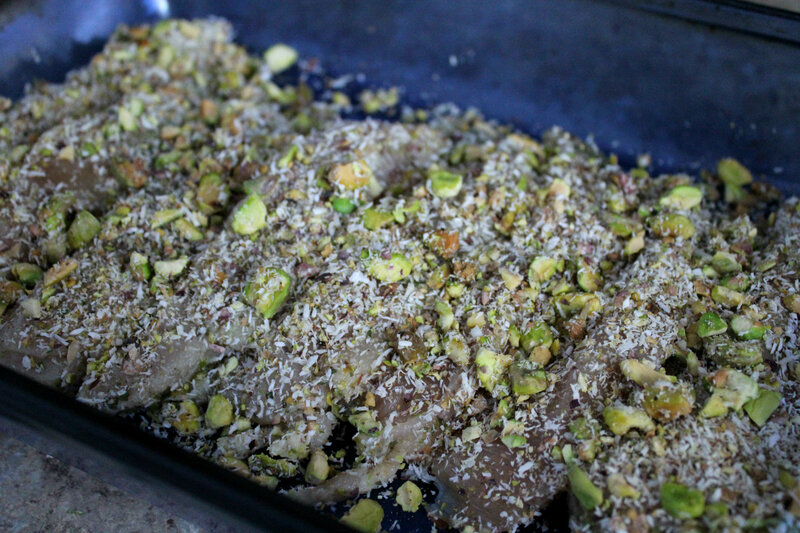 Then pour the pistachio mixture on to a plate and get you chicken out and ready to be coated. + To coat the chicken, just dip each piece on all sides with the mixture and place in the pan. 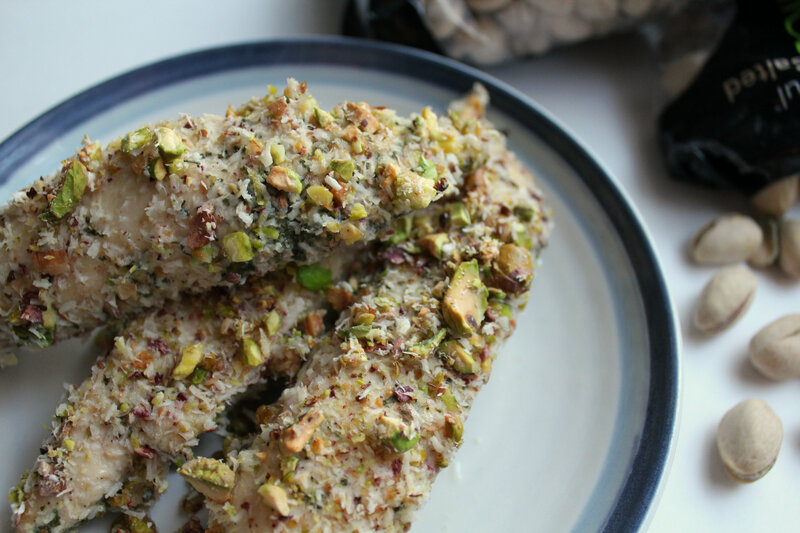 When you finished, pour the remaining pistachio and coconut mixture on top of the chicken evenly. + Then just pop the baking dish in the oven for 33-35 minutes, or until the chicken is cooked though. 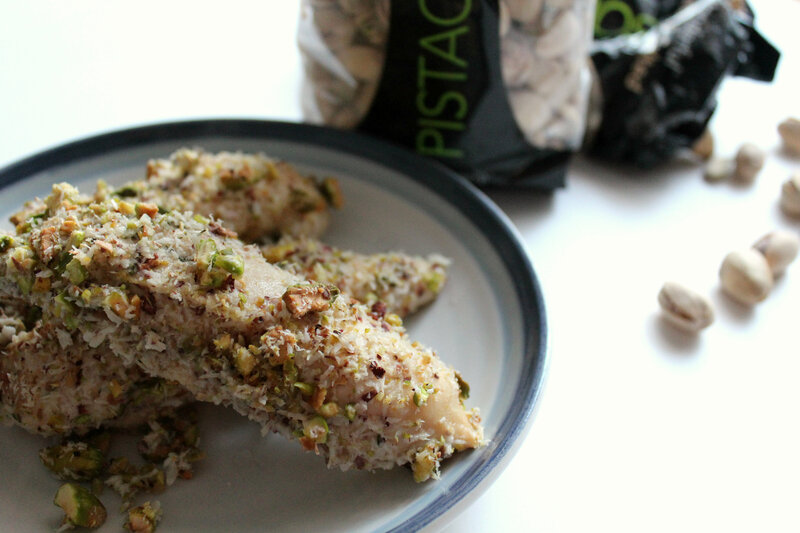 I also learned that Pistachios are really good! I remember eating them when I was really young with my dad. But it has been years and years since we have had Pistachios in the house…and now we have like 3 more bags to get though. I’m not complaining in the least! So, as I said this dish would be great paired with come tropical coconut baked plantains. The perfect dinner everyone will love. Looks fancy and indulgent, but it really is quick, easy, and super clean and healthy 🙂 Real food = Real love! I am adding in the link widget so you can see all the other wonderful ReDux member’s recipes. (The ones that actually have a shot at winning, haha!) There are some good pairings there! Do you read the fine print or directions to new things? I don’t! I think it is the worst thing. I like to just try to figure out the assembly with trial and error and then get frustrated and maybe look then! I thought I read enough for the contest, but one of the last “rules” was that it was a pairing only, not a recipe creation…sad. What is your favorite nut? That is like asking a mother who her favorite child is. I can’t pick! I love them all! Almonds, Cashews, Pecans, Hazelnuts, Pistachios, well I guess I actually am not fond of Walnuts. They just have an off taste to me.